The Pelican Lakes Restaurant and Bar, and The Sand Bar, will host a party on New Year’s Eve, and EVERYONE’S invited! Pelican Lakes Restaurant’s $18.50 per person All-You-Can-Eat Prime Rib Buffet will begin at 4 p.m. on Wednesday, Dec. 31. To reserve a table, call 970-674-1100. 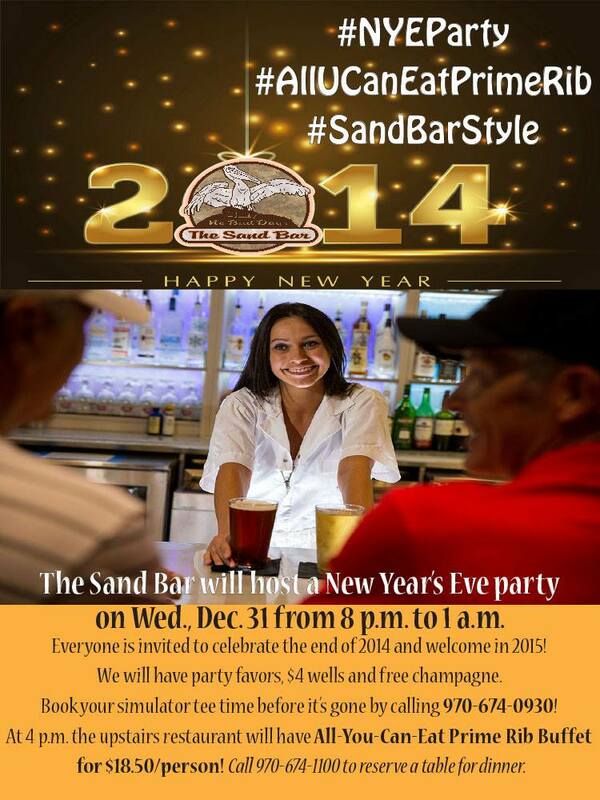 After you fill your tum-tums on Pelican Lakes’ delicious food, stick around and welcome in 2015 down at The Sand Bar. The Sand Bar is open to the public and located below the main Pelican Lakes Restaurant & Bar. Bring your golf clubs and play on one of our three golf simulators. Be sure to book a tee time first by calling 970-674-0930. All New Year’s Eve party goers will benefit from $4 well drinks, free champagne and PLENTY of New Year’s cheer!